Back to the UK with Grimaldi. We are now on board the Grimaldi ship Repubblica Argentina en-route between Buenos Aires (Argentina) and Tilbury (U.K.) via Montevideo, Paranagua, Santos, Rio de Janeiro, Dakar, Emden and Hamburg. A journey that should take 24 days. In accordance with our much changed instructions we (that is Mog, one German Scam and one French Land-Rover) arrived at the port gates at 10:45 (from where we could still see our car park home of two weeks). At 11:15 with no sign of Mr. Pablo Orsini we called his mobile phone. No answer. So we called Ms. Inés Charpentier at J. Turner & Co. (the Grimaldi agent in BA). We were told that Mr. Orsini was on his way. At about 11:45 a car drove past us into the port gates and Mr. Orsini (we assume it was Mr. Orsini, he never introduced himself) wound down his window and shouted " Vamos! ". We followed his car in convoy to the first security barrier within the port, where he stopped and walked back to each vehicle and shouted " Pasporte! " We complied. After several minutes and another " Vamos! " 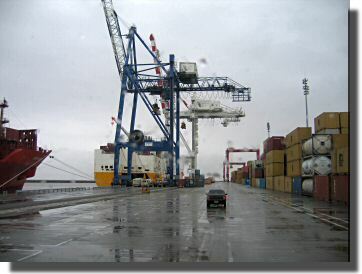 we drove thru the port to customs. Here Mr. Orsini demanded our " Documento! ". We and the German presented only our passports and our Carnet de Passage* . The French couple however also presented a vehicle document they received when they last entered Argentina. This was a mistake, as Mr. Orsini then returned their Carnet and passed the remaining documents to Argentine customs. This all took place standing in the rain outside the customs office. Within a few seconds customs had stamped our and the German Carnets (without even checking the vehicle registration numbers, let alone the chassis numbers). Not surprisingly the French couple re-presented their Carnet and asked for it to be stamped too. Argentine customs refused to stamp the French Carnet out of Argentina. Mr. Orsini supported this decision and explained to the French (in a mixture of English and Spanish) that the other vehicle document they had presented was all that he and Argentine customs required for us to board our ship. Yes, he understood that they needed their Carnet signed out of Argentina and they might loose a lot of money, but, by implication, that was not his problem! Only after 15 minutes of heated argument was the French Carnet finally stamped out of Argentina. Repubblica Argentina is a combined RoRo and container ship with cabin space (I believe) for 12 passengers. The vehicle loading deck (above) takes vehicles up to six metres in height and is, at the moment, nearly empty apart from a few agricultural machines and a scattering of containers. The upper decks get progressively lower with the top vehicle deck being suitable only for cars and SUVs. When we parked there were already about six campervans on the ramp (above left). We have had conflicting reports about life aboard a Grimaldi ship. Mick reported that the food on his ship was poor, that there was no alcohol, no coffee after breakfast, no chairs on deck and that he was bored out of his mind. Others have reported having a great time. Our ship is better than Mick's. Our cabin (top, left above) is fine, if not exactly cozy. There is a "desk" but I didn't find it until it was pointed out on day three (the very thin top "draw" of the chest of draws is a desk surface). 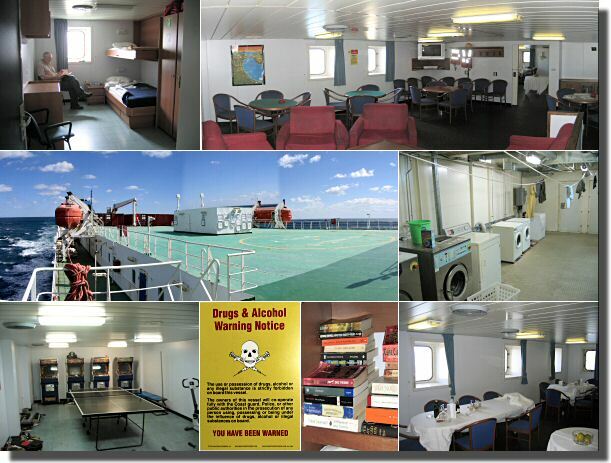 There is a lounge (top right) that we share with the ship's officers (they never use it). We also share the dining room (bottom, right) with them. Although there are notices (in Italian and English) prohibiting the possession and use of alcohol, wine is served with both lunch and dinner. The "no smoking" signs in the lounge and dinning room are ignored by the crew and there are ash trays on the tables. In the lounge there is a DVD player and a video tape player, as well as a couple of hundred books (about 28% English, 31% German and the rest Italian. I know I sorted them by language.). All the videos on our ship are in Italian. The only two DVDs are in German (only!). The following two paragraphs (in green) are an unsolicited and off-topic advertisement for a book intended to convert people of a religious persuasion to Atheism. Do not read them, or the book, if you are easily offended. I wish to thank whoever left a copy of Richard Dawkins' book The God Delusion on board the Repubblica Argentina . It is an excellent book that I planned to buy when I got to the UK (I will anyway). Recommended! See www.richarddawkins.net for details. I doubt it is a standard issue book on all Grimaldi ships so I suggest you buy your own copy to read on board. For balance you can also buy The Dawkins Delusion published, I think, by SPCK if you need further convincing. I vaguely remember reading somewhere that there was a gym on board. That is a considerable exaggeration but there is a sort of games room (bottom, left) with video games, an exercise bicycle and table-tennis (bring you own balls!). There is also a launderette (centre, right). The food so far has been better and more varied than expected. Today's lunch and dinner menus are below. 11:00 ZT - 12:00 ZT. 18:00 ZT - 19:00/20:00 ZT. As for the degree of boredom, it remains to be seen. Luckily we bought lots of English language books in BA, we have found a stray table-tennis ball, and the French couple have a dozen multilingual DVDs. Home - This page last changed on 2007-04-15.